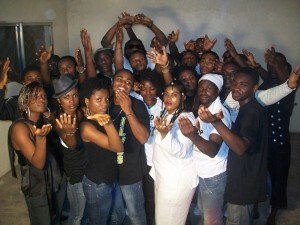 This song was conceptualised,arranged,produced and the video shot in 2 days.It was performed live on the 12 th of February 2010 at the Grand Charity Concert dubbed ”Stand Up For Haiti” held at the University of Buea Street.The song was recorded at M1 Studios and the video directed and edited at Bluedrops Studios,Buea.Special gratitude goes to the sponsors CocaCola,MTN,BlueDrops Studios,M1,AfroVisioN, IAMS and the University Of Buea. I like this!!! !kudos to u guys!! This is simply amazing….love the blend of English and cameroonian languages…. I can’t stop listening to this…one by all my friends…Awesome song.God bless you all. I can’t stop listening to this…done by all my friends…Awesome song.God bless you all.More inspiration and talent.